These Reds have more than 9 lives don’t they? There were several instances last night where the game should have been over (thanks once again to Nick Masset for burning our bullpen and nearly losing his 3rd game on the young season) in favor of the Padres and had the Reds sitting at 7-4 entering the ever tough getaway day off the West Coast. But the Reds didn’t quit. The special moment was in the bottom of the 9th with the game on the line, Cameron Maybin hit a ball that looked like a line shot into the right-center gap that would surely end this one. 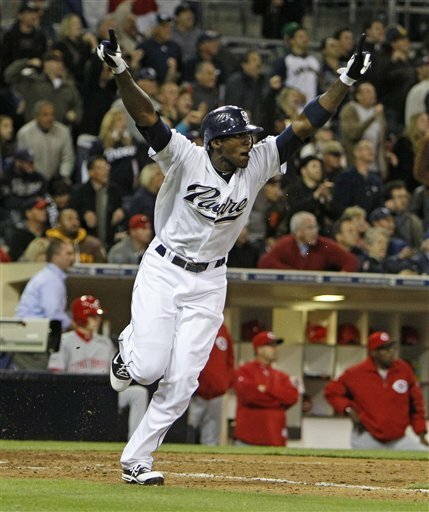 Thom Brennaman even made the point to say “and this game is over–or is it?” before Jay Bruce appeared like Superman out of nowhere to snag the line drive, dash Cameron Maybin’s hopes of celebration (pictured above) and send the game into extra innings. The other big moment that will stick with me is the way Logan Ondrusek battled out of tough situations last night. In two different innings he had a mess to clean up, and when he struck out Nick Hundley with the bases loaded and only one out in the 10th inning, you just knew they would find a way to get out of it yet again and give themselves one more inning to win the game. When the game ended last night just before the 2am hour here in Ohio, Dusty Baker had a look on his face that said a lot to me. His look said that he’s been around this game a long time, and there’s something special going on with his group of 25 here in 2010. He’s seen a lot of assembly’s of rosters in his time. He’s had good teams, bad teams, mediocre teams. He knows that there is a little magic surrounding a lot of talent and grit in this group. He won’t admit it, but I’m telling you the thought has crossed his mind a few times already. Those are the types of things you think about when you’re rolling teams without anything from Jay Bruce, or when you’re seeing a Chris Heisey drive in 8 runs in his first 14 at-bats yet there is no spot for him every day because Gomes and Stubbs have collected so many big hits. Or when Brandon Phillips and Joey Votto look to be at their never before seen peak–how scary of a thought is that? Brandon Phillips: Are you kidding me? This was the second consecutive game in which I noticed Aroldis Chapman’s velocity was down. He was 94 MPH, touching 96 that I saw, and even though he worked a 1-2-3 7th inning that saw him go strikeout (filthy slider), foul out, strike out looking on his best pitch of the night speed-wise; I’m a little concerned. We’re talking about 10 MPH on the fastball that he’s missing all of the sudden. Keep your eyes on this. Jay Bruce *MIGHT* be starting to come out of his funk ever so slowly perhaps. The box score will read only 1 for 3, 2 runs scored; but if you watched the quality of at-bats that he had, they’re the type of at-bats that a player has when he’s about to come out of a funk. Confidence building at-bats. Working an 8-pitch walk from Heath Bell who was throwing smoke. Fouling off tough pitches from a lefty. And of course probably 2 or 3 Gold Glove quality plays in the outfield. I watched this game until the bitter end, wide awake. The reason for this is I am sick as a dog. I don’t know if it’s a cold, or it’s a flu; but it’s some type of re-payment for staying out all night the day of Opening Day. Would I do it again if that is the cause? Absolutely.